Agatha “Aggie” George has gone to her rest in the arms of our Lord. She was born on Jan 26, 1923 in Waco, TX to George and Selma Alexander. She passed away August 24, 2015 at the age of 92 surrounded by her loving and devoted family. Rosary service will be held at OakCrest Funeral Home on Wednesday, August 26, 2015 at 6 pm followed by visitation until 8 p.m. Mass of the Resurrection will be held at St. Jerome Catholic Church on Thursday, August 27, 2015 at 11:00 am. Celebrants will be Msgr. Isidore Rozycki, Fr. Rakshaganathan Selvaraj, and Fr. Cyril Ejaidu. “Since 1940, I have remained in Waco on a mission to help others, to create a new generation and to boldly go where I have been told. 1941, I completed Four-C Business College where I learned to write a resume. I worked as a bookkeeper while I waited for my knight in shining army garb. In 1946, I married Taft George after his return from World War II, and remained married to this good man for over 42 years until his death in 1988. Together we raised and educated five children who grew into five beautiful, responsible adults. I also answer to Grandmother and Great-grandmother… and answer, and answer, and answer. In 1953, I found the job of my dreams in Admissions at Providence Hospital. There, I satisfied my need to help others and concurrently gained many lasting friendships. 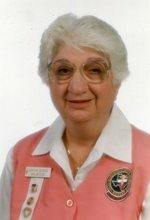 In 1983, I retired, only to continue my mission through volunteer work in the Providence Auxiliary. Mother Agatha is survived by Deacon Greg George and wife Cathey of Hewitt, Richard George and wife Donna of Waco, John George and wife Deborah of Crawford, Mary Ann George of Waco, and Sister Teresa George, DC, of Albany, NY; her brother, George Alexander Jr. and wife Maria of Dickinson; her in-laws, Tommy and Helen George of Crawford; her many friends especially those in the Providence Auxiliary and the Daughters of Charity and their affiliates. “Situ”, as she was known, is cherished by her many grandchildren, great-grandchildren, nieces and nephews. Pallbearers will be Eric Pleasant, Jason George, Steve Harwood, Michael George, David George, and Johnny George. The family expresses heartfelt thanks to Providence Hospice and Home Instead Senior Care for their kind and loving service. To send flowers to the family of Agatha George (Alexander), please visit our Heartfelt Sympathies Store.